Kamranifar, M., Naghizadeh, A. (2017). Montmorillonite Nanoparticles in Removal of Textile Dyes from Aqueous Solutions: Study of Kinetics and Thermodynamics. Iranian Journal of Chemistry and Chemical Engineering (IJCCE), 36(6), 127-137. Mohammad Kamranifar; Ali Naghizadeh. "Montmorillonite Nanoparticles in Removal of Textile Dyes from Aqueous Solutions: Study of Kinetics and Thermodynamics". 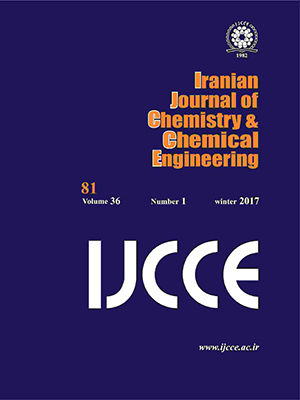 Iranian Journal of Chemistry and Chemical Engineering (IJCCE), 36, 6, 2017, 127-137. Kamranifar, M., Naghizadeh, A. (2017). 'Montmorillonite Nanoparticles in Removal of Textile Dyes from Aqueous Solutions: Study of Kinetics and Thermodynamics', Iranian Journal of Chemistry and Chemical Engineering (IJCCE), 36(6), pp. 127-137. Kamranifar, M., Naghizadeh, A. Montmorillonite Nanoparticles in Removal of Textile Dyes from Aqueous Solutions: Study of Kinetics and Thermodynamics. Iranian Journal of Chemistry and Chemical Engineering (IJCCE), 2017; 36(6): 127-137. Dyeing wastewaters are one of the most common pollutants that cause many problems for public health and environment due to dermatitis and skin rashes, cancer production, mutagenesis, etc. Thus, treatment of these wastewaters is necessary. The purpose of this study was to investigate the efficiency of montmorillonite nanoparticles as an adsorbent in adsorption process of Reactive Yellow 15 (RY15) and Reactive Yellow 42 (RY42) dyes from aqueous solutions. In this study, montmorillonite nanoparticles were used to remove RY15 and RY42 dyes. The effect of different variables such as pH, contact time, dye concentration and adsorbent dosage was studied. Finally, the effect of process temperature and thermodynamic was studied. Also, pseudo-first and second orders of kinetics were studied. The results showed that 3 is the best pH for the removal of both dyes. As contact time increases to 15 minutes, adsorption capacity increases and then reaches an approximately constant value. Adsorption capacity was also increased with increased dye concentration. By changing the adsorbent dosage from 0.2 to 0.6 g/L, adsorption capacity for RY15 and RY42 was reduced from 142and 166 to 63 and 59 mg/g, respectively. The results also showed that both dyes had the highest correlation with pseudo-second-order kinetics. The results of analyzing the process thermodynamics and temperature showed that values of DH, DS and DG are negative for both dyes. Selcuk H., Bekbolet M., Photocatalytic and Photoelectrocatalytic Humic Acid Removal and Selectivity of TiO2 Coated Photoanode, Chemosphere, 73(5): 854-8 (2008). Alaei M., Mahjoub A.R., Rashidi A., Effect of WO3 Nanoparticles on Congo red and Rhodamine B Photo Degradation, Iran J. Chem. Chem. Eng (IJCCE), 31(1):23-9 (2012). Rezaei A., Kamranifar M., Zabihollahi S., Rahimi H., Pourzamani Hr., Evaluation the Efficiency of Magnetic Iron Oxide Absorbents for the Removal of Navy Blue CE-RN Textile Dyes From Aqueous Solutions, Health. System. Res, 12(1): 1-6 (2016). Naseri A., Barati R., Rasoulzadeh F., Bahram M., Studies on Adsorption of Some Organic Dyes from Aqueous Solution onto Graphene Nanosheets, Iran J. Chem. Chem. Eng (IJCCE), 34(2): 51-60 (2015). Alidadi H., Karimian H., Bazrafshan E., Najaf Poor A.A., Rafe S., A Survay on Dye Removal From Colored Textile Wastewater Using Multi‐Walled Carbon Nanotubes and Palm Ash as a Natural Adsorbent. J. Res. Environ. Health. (JRHS), 1(1): 10-9 (2015). Gomri F., Boutahala M., Zaghouane-Boudiaf H., Korili S.A., Gil A., Removal of Acid blue 80 From Aqueous Solutions by Adsorption on Chemical Modified Bentonites, Desalin. Water Treat, 1-10 (2016). Pourbabaee A.A., Bostani S., Amozzegar M.A., Naddaf R., Decolorization of Cibacron black w-55 under Alkaline Conditions by New Strain of Halomonas sp. Isolated from Textile Effluent, Iran J. Chem. Chem. Eng. (IJCCE), 30(4): 63-70 (2011). Crini G., Badot P-M., Application of Chitosan, a Natural Aminopolysaccharide, for Dye Removal From Aqueous Solutions by Adsorption Processes Using Batch Studies: A Review of Recent Literature, Prog. Polym. Sci., 33(4): 399-447 (2008). Daraei A., Treatment of Textile Waste Water with Organoclay. Iran J. Chem. Chem. Eng. (IJCCE), 32(2): 67-70 (2013). Vidhyadevi T., Murugesan A., Kalaivani S., Anil Kumar M., Thiruvenkada Ravi K., Ravikumar L., Anuradha C.D., Sivanesan S., Optimization of the Process Parameters for the Removal of Reactive Yellow Dye by the Low Cost Setaria Verticillata Carbon Using Response Surface Methodology: Thermodynamic, Kinetic, and Equilibrium Studies, Environ. Prog. Sustain. Energy, 33(3): 855-65 (2014). Handayani D.S., Purnawan C., Hastuti S., Hilmiyana D., Adsorption of Remazol Yellow FG From Aqueous Solution on Chitosan-Linked PT-Butylcalix " Arene. IOP Conference Series", Mater. Sci. Eng, IOP Publishing (2016). Royer B., Cardoso N.F., Lima E.C., Vaghetti J.C.P., Simon N.M., Calvete T., Veses R.C., Applications of Brazilian Pine-Fruit Shell in Natural and Carbonized Forms as Adsorbents to Removal of Methylene Blue From Aqueous Solutions—Kinetic and Equilibrium Study, J. Hazard. Mater, 164(2–3): 1213-22 (2009). Naghizadeh A., Ghafouri M., Jafari A., Investigation of Equilibrium, Kinetics and Thermodynamics of Extracted Chitin from Shrimp Shell in Reactive Blue 29 (RB-29) Removal from Aqueous Solutions, Desalin. Water Treat, 70: 355-63 (2017). Nadi H., Alizadeh M., Ahmadabadi M., Yari A.R., Hashemi S., Removal of Reactive Dyes (Green, Orange, and Yellow) from Aqueous Solutions by Peanut Shell Powder as a Natural Adsorbent, Arch. Hyg. Sci. 1(2): 41-47 (2012). Azizian S., Kinetic Models of Sorption: a Theoretical Analysis, J. Colloid Interface Sci., 276(1): 47-52 (2004). Gueu S., Yao B., Adouby K., Ado G., Kinetics and Thermodynamics Study of Lead Adsorption on to Activated Carbons from Coconut and Seed Hull of the Palm Tree, Int. J. Environ. Sci. Technol, 4(1): 11-7 (2007). Manikandan P., Palanisamy P., Baskar R., Sakthisharmila P., Sivakumar P., A Comparative Study on the Competitiveness of Photo-Assisted Chemical Oxidation (PACO) with Electrocoagulation (EC) for the Effective Decolorization of Reactive Blue Dye, Iran J. Chem. Chem. Eng. (IJCCE), 36(1): 71-85 (2017). Faraji H., Mohamadi A.A., Soheil Arezomand H.R., Mahvi A.H., Kinetics and Equilibrium Studies of the Removal of Blue Basic 41 and Methylene Blue from Aqueous Solution Using Rice Stems, Iran J. Chem. Chem. Eng. (IJCCE), 34(3): 33-42 (2015). Naghizadeh A., Shahabi H., Ghasemi F., Zarei A., Synthesis of Walnut Shell Modified with Titanium Dioxide and Zinc Oxide Nanoparticles for Efficient Removal of Humic Acid from Aqueous Solutions, J. Water Health, 14(6): 989-97 (2016). Robinson T., McMullan G., Marchant R., Nigam P., Remediation of Dyes in Textile Effluent: a Critical Review on Current Treatment Technologies with a Proposed Alternative, Bioresour. Technol, 77(3): 247-55 (2001). Crini G., Non-Conventional Low-Cost Adsorbents for Dye Removal: A Review, Bioresour. Technol, 97(9): 1061-85 (2006). Naghizadeh A., Nabizadeh R., Removal of Reactive Blue 29 Dye by Adsorption on Modified Chitosan in the Presence of Hydrogen Peroxide, Environ. Prot. Eng., 42(1): 149-68 (2016). Garg V.K., Gupta R., Bala Yadav A., Kumar R., Dye Removal From Aqueous Solution by Adsorption on Treated Sawdust, Bioresour. Technol, 89(2): 121-4 (2003). Wang K.S., Chen H.Y., Huang L.C., Su Y.C., Chang S.H., Degradation of Reactive Black 5 Using Combined Electrochemical Degradation-solar-Light/Immobilized TiO2 Film Process and Toxicity Evaluation, Chemosphere, 72(2): 299-305 (2008). Shi B., Li G., Wang D., Feng C., Tang H., Removal of Direct Dyes by Coagulation: The Performance of Preformed Polymeric Aluminum Species, J. Hazard. Mater., 143(1–2): 567-74 (2007). Bouguettoucha A., Reffas A., Chebli D., Amrane A., Adsorption of the Cationic Dye Ethyl Violet on Acid and Alkali-Treated Wild Carob Powder, A Low-Cost Adsorbent Derived from Forest Waste, Iran J. Chem. Chem. Eng (IJCCE), 36(1): 87-96 (2017). Makhoukhi B., Djab M., Amine Didi M., Adsorption of Telon Dyes onto Bis-Imidazolium Modified Bentonite in Aqueous Solutions, J. Environ. Chem. Eng., 3(2): 1384-92 (2015). Jiang Y., Gong J.L., Zeng G.M., Ou X.M., Chang Y.N., Deng C.H., Zhang J., Liu H.Y., Huang Sh.Y., Magnetic Chitosan–Graphene Oxide Composite for anti-Microbial and Dye Removal Applications, Int. J. Biol. Macromol, 82: 702-10 (2016). Bretanha M.S., Dotto G.L., Vaghetti J.C., Dias S.L., Lima E.C., Pavan F.A., Giombo Persimmon Seed (GPS) an Alternative Adsorbent for the Removal Toluidine Blue Dye from Aqueous Solutions, Desalin. Water Treat, 57(58): 1-12 (2016). Naghizadeh A., Comparison between Activated Carbon and Multiwall Carbon Nanotubes in the Removal of Cadmium (II) and Chromium (VI) from Water Solutions, J. Water Supply Res Technol.-Aqua, 64(1): 64-73 (2015). Eren Z., Acar F.N., Adsorption of Reactive Black 5 from an Aqueous Solution: Equilibrium and Kinetic Studies, Desalination, 194(1): 1-10 (2006). Garg V., Kumar R., Gupta R., Removal of Malachite Green Dye from Aqueous Solution by Adsorption Using Agro-Industry Waste: a Case Study of Prosopis Cineraria, Dyes Pigment, 62(1): 1-10 (2004). Pereira M.F.R., Soares S.F., Órfão J.J., Figueiredo J.L., Adsorption of Dyes on Activated Carbons: Influence of Surface Chemical Groups, Carbon, 41(4): 811-21 (2003). Litchfield D.W., Baird D.G., The Role of Nanoclay in the Generation of Poly (Ethylene Terephthalate) Fibers with Improved Modulus and Tenacity, Polymer, 49(23): 5027-36 (2008). Öztürk A., Malkoc E., Adsorptive Potential of Cationic Basic Yellow 2 (BY2) Dye onto Natural Untreated Clay (NUC) from Aqueous Phase: Mass Transfer Analysis, Kinetic and Equilibrium Profile, Appl. Surf. Sci., 299: 105-15 (2014). Karim A.B., Mounir B., Hachkar M., Bakasse M., Yaacoubi A., Removal of Basic Red 46 Dye from Aqueous Solution by Adsorption onto Moroccan Clay, J. Hazard. Mater, 168(1): 304-9 (2009). Jafari Mansoorian H.J., Yari A.R., Mahvi A.H., Alizadeh M., Sahebian H., Application of Acaciatortilis Shuck as of Low-Cost Adsorbent to Removal of azo Dyes Reactive Red 198 and Blue 19 from Aqueous Solution, Arch. Hyg. Sci, 3(1): 165-75 (2014). Hashemian S., Removal of Methyl Violet by Adsorption onto Bentonite with Copper Ferrite Nano-Particles, J. Color. Sci. Technol., 4: 191-7 (2011). Asgher M., Bhatti H.N., Evaluation of Thermodynamics and Effect of Chemical Treatments on Sorption Potential of Citrus Waste Biomass for Removal of Anionic Dyes from Aqueous Solutions, Ecol. Eng., 38(1): 79-85 (2012). Naghizadeh A., Regeneration of Carbon Nanotubes Exhausted with Humic Acid Using Electro-Fenton Technology, Arab. J. Sci. Eng., 41(1): 155-61 (2016). Bazargan-Lari R., Zafarani H.R., Bahrololoom M.E., Nemati A., Removal of Cu(II) Ions from Aqueous Solutions by Low-Cost Natural Hydroxyapatite/ Chitosan Composite: Equilibrium, Kinetic and Thermodynamic Studies, J. Taiwan Inst. Chem. Eng., 45(4): 1642-8 (2014). Ai L., Zhang C., Liao F., Wang Y., Li M., Meng L., Jiang J., Removal of Methylene Blue from Aqueous Solution with Magnetite Loaded Multi-Wall Carbon Nanotube: Kinetic, Isotherm and Mechanism Analysis, J. Hazard. Mater., 198: 282-90 (2011). Song Z., Chen L., Hu J., Richards R., NiO (111) Nanosheets as Efficient and Recyclable Adsorbents for Dye Pollutant Removal from Wastewater, J. Nanotechnology, 20(27): 2-10 (2009). Gong R, Ding Y, Li M, Yang C, Liu H, Sun Y. Utilization of Powdered Peanut Hull as Biosorbent for Removal of Anionic Dyes from Aqueous Solution, Dyes Pigment, 64(3): 187-92 (2005). Luo P., Zhao Y., Zhang B., Liu J., Yang Y., Liu J., Study on the Adsorption of Neutral Red from Aqueous Solution onto Halloysite Nanotubes, Water Res, 44(5): 1489-97 (2010). Arami M., Limaee N.Y., Mahmoodi N.M., Evaluation of the Adsorption Kinetics and Equilibrium for the Potential Removal of Acid Dyes Using a Biosorbent, Chem. Eng. J., 139(1): 2-10 (2008). Al-Ghouti M.A., Khraisheh M.A.M., Ahmad M.N.M., Allen S., Adsorption Behaviour of Methylene Blue onto Jordanian Diatomite: A Kinetic Study, J. Hazard. Mater, 165(1–3): 589-98 (2009). Vimonses V., Jin B., Chow C.W.K., Saint C., Enhancing Removal Efficiency of Anionic Dye by Combination and Calcination of Clay Materials and Calcium Hydroxide, J. Hazard. Mater, 171(1–3): 941-7 (2009). Kumar K.V., Porkodi K., Mass Transfer, Kinetics and Equilibrium Studies for the Biosorption of Methylene Blue Using Paspalum Notatum, J. Hazard. Mater, 146(1–2): 214-26 (2007). Yang J., Qiu K., Preparation of Activated Carbons from Walnut Shells via Vacuum Chemical Activation and Their Application for Methylene Blue Removal, Chem. Eng. J., 165(1): 209-17 (2010). Errais E., Duplay J., Darragi F., M'Rabet I., Aubert A., Huber F., Morvan, G., Efficient Anionic Dye Adsorption on Natural Untreated Clay: Kinetic Study and Thermodynamic Parameters, Desalination, 275(1): 74-81 (2011). Sheikh Mohammadi A., Sardar M., Mohammadi A., Azimi F., Nurieh N., Equilibrium and Kinetic Studies on the Adsorption of Acid Yellow 36 Dye by Pinecone, Arch. Hyg. Sci., 2(4): 158-64 (2013).